Are you seeking a meaningful volunteer experience in one of the most alluringly exotic and largest country in East Africa? Volunteer in Tanzania, and have the opportunity to explore the countless travel attractions against the background of spectacular picturesque terrains and a cultural mishmash of over 100 ethnic groups, while making a real difference to the lives of those in need. From the astounding wildlife-watching, the vast Savannas of the Serengeti, the tranquility of Zanzibar beaches, to the majestic snow-capped peak of Mount Kilimanjaro, Tanzania is a traveler’s dream come true. Bordered by Kenya, Uganda, Rwanda, Zambia, Burundi and the Democratic Republic of the Congo, Tanzania has one of the most fascinatingly diverse natural environments in the world. It’s little wonder why thousands flock to the spectacular country each month. Despite the growth in the tourism industry, Tanzania remains poor, and the life of an ordinary Tanzanian is an arduous struggle each day. The healthcare system is in dire need of volunteers, as the people face the onslaught of the HIV/AIDS virus, preventable diseases, and young mortality rates. New Hope works with many local organizations that aim to empower the power and encourage development within the local communities. Volunteer in Tanzania, and experience the best of Tanzania while uplifting the lives of the local people! New Hope Volunteers will arrange for the accommodation and meal of the volunteers throughout the program. 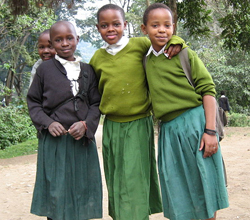 Volunteers will be staying with host families throughout their stay in Tanzania. After the language program, volunteers will stay with a host family. Our host families have been carefully screened and chosen and they will have experience of hosting international volunteers before. The host families will provide you with a warm, comfortable and secure place to stay. You'll have a room to yourself and eat 3 local meals together with your host family. At least one member of the host family will be able to communicate with you in English. Living with a host family will also provide you with a wonderful opportunity to learn about local culture and customs. During the volunteer program, our country coordinator will be in touch with you every 10-15 days to make sure you're comfortable and happy. Volunteers will also have access to coordinator's mobile phone that can be reached anytime should a problem arise. Will I have time to explore Dar es Salaam, Arusha and Moshi during my stay?